Dewi settles down after a long day at work, slouching over an empty dining table, struggling to find an appetite. Suddenly craving for Sate (also known as Satay), she opens the GrabFood app, impatiently scrolls through, then unexpectedly finds a tempting photo of Ayam Penyet! She instinctively decides on Ayam Penyet alongside Satay and ordering is done within 90 seconds! 27 minutes later, the driver delivers a dozen sticks of juicy chicken skewers with a warm bag of rich-creamy peanut sauce as well as a plate of fragrant coconut rice accompanied by steaming crispy chicken, smeared with chili. Dewi cracks open a can of diet coke ordered from the same restaurant, ready to devour her freshly delivered meal! Like Dewi, you can find a wide variety of mouth-watering local cuisine through GrabFood, soon to be Southeast Asia’s largest food delivery app! As Grab aspires to be a super app serving the most essential daily needs of Southeast Asians, we recognize that food is one element that gels all other aspects of life together. Especially in Southeast Asia, food plays a preeminent role in both connecting people and reminding us of our heritage. In Southeast Asia, GrabFood delivers throughout 116 cities, offering a wide selection of cuisine – Indonesian, Western, Asian, European, Mexican, Fusion, including some of the best selections of local street food. Insulated bags also means receiving food hot and fresh, just as you would eat it on the spot! This article will take you on a delicacy tour around Indonesia, Malaysia, and Singapore – introducing you to the most appetising and palatable data points. Did you know we’ve delivered more than 13 million plates of Ayam Geprek in Indonesia so far in 2018? Did you know that we’ve delivered more than 7,000 burgers and pizzas on World Cup final match day alone in Singapore? Read on and find out more interesting insights! Let’s look at the most popular food items ordered in each country. 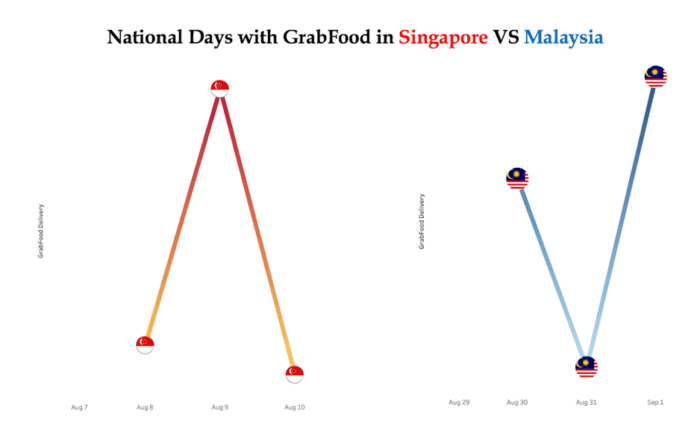 GrabFood data reveals that there are more unexpected similarities than striking differences! 2.1 We love Bubble Tea! One surprising similarity across all three countries is our unwavering love for sweet bubble tea! 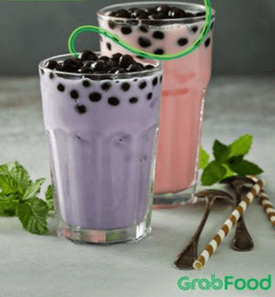 Grab is satisfying your unquenchable thirst for bubble tea by serving it as the Top 2 item in Singapore, Malaysia, and Indonesia! Indonesia especially loves Hazelnut Chocolate Bubble Tea, while Malaysia’s favorite is Brown Sugar Pearl Bubble Tea, and Singapore is in love with the classic Milk Tea with Pearls. Sweet, chewy, mochi-texture pearls have almost become a way of life in Southeast Asia! What’s different is ‘when’ people tend to order Bubble Tea delivery. 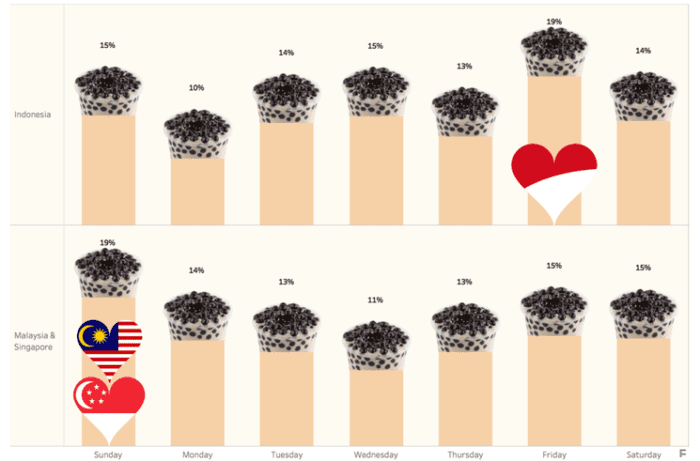 While Indonesians seek a cup of sweet tea at the end of the work week (Fridays), Malaysians and Singaporeans tend to order this beverage mostly on the weekends, especially on Sundays! 2.2. 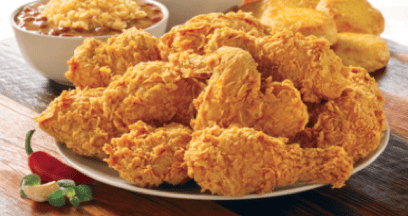 We love Fried Chicken, our Comfort Food! Another interesting similarity is universal admiration for smoking hot fried chicken! All three countries have it as one of the top 10! (C) People are after a quick, tasty, and inexpensive meal in this frenzied society we live in today. It’s interesting to note the different variations of fried chicken available and loved across the region. Ranked #1 in Singapore is fried chicken from fast-food chains, while Ayam Goreng and Ayam Geprek take top spot in Malaysia and Indonesia respectively! Looks like we have all interpreted our love for fried chicken in our own ways, turning them into more sizzling, spicy, and savoury dishes! 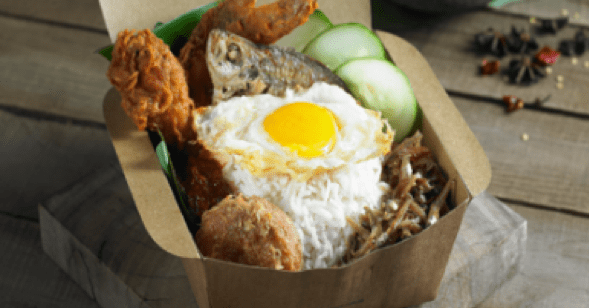 One last point on fried chicken – Nasi Lemak! This delightful combination of fried chicken, with refreshing cucumber pieces on top of ikan bilis, soft egg, otah, and extra-protein-provider ikan kuning, all joyfully mixed with irresistible sambal chilli sauce and golden toasted peanuts — it is no surprise that the homely Nasi Lemak is the only rice-dish in Singapore’s top 10 while it is the top 3 in Malaysia’s GrabFood orders. In the month of August, Singapore celebrated her 53rd birthday on the 9th, while Malaysia celebrated her National Day on the 31st. On these special dates, we observed the unique behaviours and patterns of both countries. See the peak in Singapore and the trough in Malaysia in the chart above? We found that on their respective National Days, Singapore ordered more delivery food (300% more food compared to August average), while Malaysia opted to dine out or cook at home on public holidays! This year, we witnessed the Russia World Cup and Asian Games, both of which happens every 4 years. And GrabFood was there to celebrate with you! When the World Cup Final was aired on July 15 2018 at 11 pm in Singapore, we delivered almost 90% more food than the July average! Likewise, the Asian Games Closing Ceremony on September 2 saw the peak of GrabFood orders which was equivalent to 3 average days in August combined! Would you have guessed that not only did more people order, but they did so in bigger groups to share the sportsmanship and can-do spirit? If yes, you are absolutely spot on! Bigger and grander orders were delivered during the Final Match and Closing Ceremony. While the general a la carte orders went up by 80%, Feast & Sharing items filled the table 206% more and Set Meals (complete with drinks and sometimes dessert) were ordered 250% more on this day. To top that, generosity of celebrating together was reflected in people’s order of Size (L) or Upsized items, which increased by almost 270%! There is definitely something special about sports events that evokes patriotism, bonds people, and calls for generous portion of food! Not only did our sports-enthusiasts gather in front of TVs, they gathered in larger groups, to fully enjoy the fervent festivals with “feasts” from GrabFood! GrabKitchen – Have you heard? GrabKitchen is a “Cloud Commercial Kitchen” initiative that Grab has put together, teamed up with the most popular local merchants to bring delicacies, including Gudeg Yu Djum from Yogyakarta and Warung Anugrah from Makassar. We’ve successfully launched the first GrabKitchen in Kedoya with 20% reduction in delivery time (which also means less waiting time for drivers at the GrabKitchen) as well as increased convenience for consumers to choose greater variety in one order. The idea of bringing together various merchants to set up a common kitchen has resulted in higher fulfillment rate compared to GrabFood, thanks to its’ higher efficiency and high turnover rate. Also, Kedoyans now can order from multiple merchants in the same order, cooked from one GrabKitchen, to satisfy your cravings! For every country, event, occasion, we all have our own spiced version of stories to tell through food. Grab is honored to have been part of your everyday life – celebrating your country’s birthday, cheering with you for the World Cup final match, making history together with Indonesia for successful Asian Games 2018 – or just appreciating every day with a delectable and nutritious meal for you and your loved ones! Food brings out pride and history, touch of homeliness that bonds people together over a dining table. And Grab is enhancing that experience with our rapidly expanding choices and convenience at your fingertip. All this talk about food got you feeling hungry? Good! Fire up the GrabFood app and order something delicious. You’ll solve those hunger pangs in no time!